In this phase, players pick cards with resources that enable expansion on the board. In general he/she who gets most food, plays last. First player expands with least food. Phase 2: Players expand on the board to earn points or money. Players begin to form strings and/or clusters of huts and pay for placing them with their food cards. Depending on where huts are placed, they either score points or earn camels (money). Phase 3: Players spend money/camels on various investments. A player either goes for one-time bonuses from the nobles of Assur, or makes long-term investments by offerings to gods and building Ziggurats. The game lasts for three eras, made up of 2-3 of such cycles. After each era comes the flood: the board is partially cleaned up, but players also capitalize on their investments from phase 3. 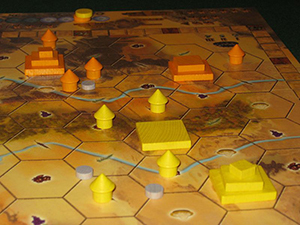 Each round, players also score points for huts (those built on fertile land between the two rivers bring more points) and ziggurat tiles. In comparison to other games from Ystari´s series - Assyria is lighter than Caylus, Olympos, Ys or Sylla (in terms of complexity, available choices - represented by numerous tiles, cards, icons, cards etc. that need to be remembered and can be combined during play), but heavier than Yspahan, Mykerinos or Metropolis.